Beautifully engraved certificate from the IntelCom Group, Inc. issued in 1995-1996. This historic document was printed by the Canadian Banknote Company and has an ornate border around it with a vignette of the company's initials in large letters. This item has the printed signatures of the company’s chairman and secretary and is over 4 years old. In the early 1990s, the letters "ICG" stood for IntelCom Group. When the company reincorporated in 1996 under the name ICG Communications, Inc., the three letters became the company name and no longer represented the former name, IntelCom Group. ICG Communications, Inc. owns the Open Road Infrastructure™ that is taking business communications to a new level. The company has a rich history within the fast-paced, telecommunications industry. ICG evolved from a satellite communications company to a nationwide, facilities-based provider of both voice and data services. Today, ICG provides numerous products and services to its three major customer segments: Internet service providers (ISPs), small- to medium-sized businesses and long-distance carriers. The company's roots can be traced back to the mid-1980s and a business plan to develop satellite communications capabilities in Denver. During this time, the company, then known as Teleport Denver, Ltd. (TDL), constructed a satellite teleport facility in south Denver. Completed in 1987, the 24-hour managed facility housed eight earth stations and was touted for its capability to reach five continents in a single satellite hop. With the AT&T divestiture, TDL also began to cast its eye toward the local telephone marketplace. The first niche opportunity that emerged for local transport companies was the "private line," an opportunity reinforced by TDL's experience in leasing circuits from the Regional Bell Operating Company (RBOC) in Denver. Due to the exorbitant prices for leasing these circuits, TDL management decided to build its own private, fiber-optic connections to provide dedicated access to interexchange carriers. With the emergence of the first competitive access providers (CAPs) in the mid- to late-1980s, TDL management recognized a business opportunity in Denver to provide long distance and private line services to select business customers. In November 1990, the company began constructing fiber-optic rings in south Denver. The Denver network became operational in June 1991 and was completed during the beginning of 1992. In an effort to expand its geographic presence, TDL (at this time known as IntelCom Group, Inc.) made numerous acquisitions between 1991 and 1994, including Conticomm, Inc.; Fiber Optic Technologies, Inc. (FOTI); PrivaCom; Ohio LINX; MidAmerica Cable; and Bay Area Teleport, Inc. These acquisitions expanded ICG's network capabilities in Colorado, California, Ohio, Arizona, and the Southeastern United States. In February 1994, ICG expanded its product line beyond transport to include switched services. The company entered the switched services market by installing its first Class 5 end-office switch in August 1994. Shortly thereafter, the company began deploying switches in other key markets, including California and Ohio. By May 1995, ICG was operating nine switches with four more in the deployment stage. Throughout the next few years, ICG entered into a number of fiber lease agreements with electric utilities across the country. 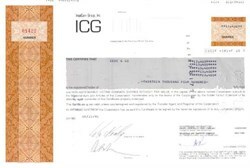 These early agreements set the stage for ICG's unique utility partnering strategy which has helped ICG dramatically expand its network, services and distribution channels in key markets quickly and cost-effectively. In 1995, ICG also entered into a strategic alliance with Southern New England Telephone, which allowed ICG to offer a nationwide SS7 network. With the passage of the Telecom Act in February 1996, ICG was poised to enter the $100 billion a year local telephone market. In April, the company reincorporated in the United States under the name ICG Communications, Inc.
Also in 1996, ICG implemented an aggressive local telecommunications strategy that focused on a cohesive, regional network expansion in California, Colorado, the Ohio Valley, and the Southeast. As part of this strategy, recruiting efforts accelerated, and ICG had nearly 1,300 employees nationwide by year-end. In continued efforts to prepare for entry in the local telephone market, ICG signed a seven-year, $1 billion agreement in September with Lucent Technologies/Bell Labs to purchase telecommunications equipment, including 5ESS switching systems and other technical services. In 1997, ICG formally entered the local telephone market and began offering local, long distance and calling card services primarily to small- and mid-sized business customers. By February, ICG had begun to sell local services in California. Shortly thereafter, ICG launched dial tone service in every other regional ICG market and ended the year with more than 141,000 lines provisioned. During 1998 and 1999, ICG made a number of key decisions that would prepare the way for its emergence as a leader in the data and Internet services arena. Recognizing the incredible opportunity available in the exploding Internet industry, ICG management completed a merger with Netcom On-Line Communication Services Inc., a leading provider of Internet services. The merger allowed ICG to enter the Internet and data services market. In January 1999, ICG sold the U.S. customer base of its Netcom subsidiary to MindSpring Enterprises, Inc., but retained the Netcom network backbone (which included 227 points of presence and served approximately 700 cities). In addition, ICG entered into a second agreement in which MindSpring agreed to utilize the data network and network management capabilities of ICG. This strategic decision set the stage for ICG's emerging role as an Internet enabler. Over the next several months, ICG also signed multi-year agreements with a number of key ISPs to provide access, transport and network management services. During the third quarter of 1999, ICG reached definitive agreements for the sale of both its fiber optic division, Fiber Optic Technologies Inc. (FOTI), and its Satellite Services division. Both sales were finalized in the fourth quarter. The decision to sell the two divisions was in line with ICG's overall business strategy to focus on its core strengths-providing access and transport to Internet service providers, telecom services to businesses nationwide and direct connectivity to interexchange carriers. In April 2000, ICG raised $750 million in new equity capital from investors that included affiliates of Liberty Media Corporation (NYSE: LMG.A, LMG.B), Hicks, Muse, Tate & Furst Incorporated and Gleacher Capital Partners. This investment, combined with recent vendor financing, fully funds ICG's capital program for 2000. ICG is continuing to build alliances with other industry-leading companies in a shared commitment to provide reliable and innovative products and services to customers. Recent partnerships include collaborating in field trials of VoDSL with Jetstream Communications and Covad Communications, providing DSL services with Covad and other DSL vendors, and a common share stock exchange with Teligent, Inc., a leader in fixed wireless broadband communications. ICG also continues to partner with key industry leaders, Lucent, Cisco and Nortel, in the expansion of ICG's nationwide voice and data network. The company also is developing products to take advantage of the new trend for businesses, ISPs and application service providers (ASPs) to outsource their network needs so they can focus on their core business. At the end of second quarter 2000, ICG had approximately 1.1 million access lines in service, including a record number 208,000 lines installed in second quarter alone. The company owns 4,767 fiber route miles and 67 switches. ICG has 3,000 full-time employees nationwide. ICG has built an infrastructure that allows businesses, ISPs and carriers to take advantage of the new Internet economy and the fast-growing telecommunications industry. With its Open Road Infrastructure™ , ICG works as a partner with the customer, providing endless possibilities to businesses, ISPs and carriers so they can achieve their destinations.